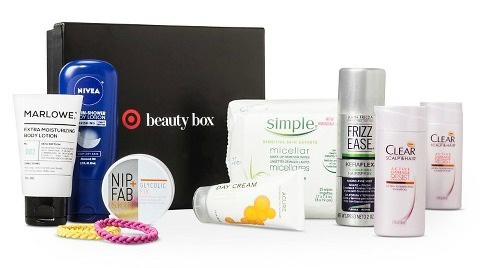 Tracy's Notebook of Style: NEW Target $7 Beauty Boxes Now Available!! Happy Monday! 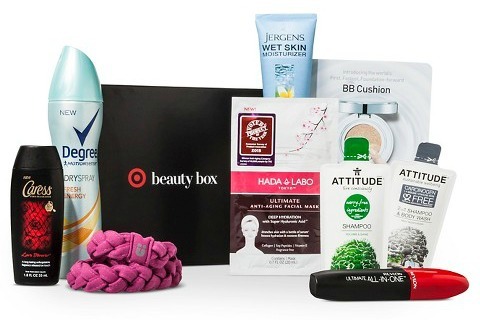 Target has two new beauty boxes available to help you start off the new year with refresh and renewal themed products. Each box is $7 with a $30 value plus free shipping. Don't wait if you want one, they sell out fast! This must-have day cream contains gotu kola stem cells and chlorella growth factor to help your skin retain hyaluronic acid and fight environmental damage and free radicals. This versatile formula can be used while styling hair or to lock in a finished look. Its micro-fine mist delivers a soft, brushable hold. This skin-pampering, in-shower lotion is enriched with almond oil to give your skin instant moisture that lasts up to 24 hours. These radiance-boosting pads are soaked in exfoliating glycolic acid to help retexture and resurface to unveil younger-looking skin. Say goodbye to snags with these hair ties made without metal. Gently remove makeup and impurities, leaving your skin cleansed and instantly hydrated, with these makeup remover wipes. No artificial perfumes, dyes or harsh chemicals. An intense moisturizer with a combination of revitalizing antioxidants and extracts to help soften and smooth dry skin. Make your hair more resilient to breakage with Clear’s Active Damage Resist system. Infused with Omega 3-6-9, this specially designed complex of vitamins hydrates the scalp and hair, and helps restore shine, smoothness and strength from root to tip. It’s the first body wash ever to use fragrance-release pearls with touch-activated technology. Release a burst of perfume every time you touch your skin—all day long. This shampoo and body wash is vegetable based and biodegradable. Plus, it’s formulated to be carcinogen free and hypoallergenic. Vegan, not tested on animals. Get 5-in-1 cushion technology that works to brighten, protect, cool and cover your skin while fending off shine. A comfortable, stretchy band with a braided design for stylish, no-slip grip. This dry spray uses a 48-hour MOTIONSENSE formula that goes on instantly dry for a cleaner feel and better protection. Get 24 hours of soft skin with this instant-absorbing formula that gives you twice the moisturizing power in half the time. Get healthy, beautiful hair with this volumizing shampoo. It is vegetable based, biodegradable, carcinogen free and hypoallergenic. Vegan, not tested on animals. This high-impact formula delivers 5 benefits in 1 product: volume, length, definition, lift and rich, intense color. A lightweight, deeply hydrating mask that drenches skin with serum to boost hydration, smooth fine lines and restore firmness and bounce to your skin. Ahhh I missed it again LOL.